This book was recommended to me by one of my LinkedIn contacts. Unfortunately, I have lost the recommendation but if by chance he wants a credit please send me a message. I must confess that before I started the book, I doubted I would enjoy it. I could not have been more wrong, and the book is well worth a read. One acid test I use with a new book is have I learned anything? I learnt a new phrase “toddler Armageddon”. This refers to the envy of siblings who explode with crying rage when they think another sibling has gained an unfair advantage. According to the Theory of Mind empathy does not develop in a child till he or she reaches the age of four. This particularly resonated as we spent this Christmas hosting both our daughters’ families including five grandchildren aged two to eight in our house for a week each and then going on a joint holiday together. The author, Jack Lewis PhD, is a photogenic British neuroscientist, who since gaining his Phd in 2005 has developed a parallel career as television personality and professional speaker. 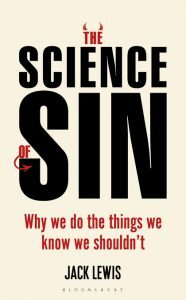 The Science of Sin is his third book and first solo effort. Using the list of the Seven Deadly Sins developed by Pope Gregory in AD 590, as a table of contents Lewis carries out a wide ranging analysis covering the neurological basis of each sin and possible methods of overcoming the temptation. For example when discussing the sin of Pride, Lewis spends significant time on how much of it is caused by Narcissistic Personality Disorder. He admits to being at the higher end of the spectrum but is worried about the rise in society in NPD due to reality TV and Facebook. Supposedly the best thing that people at the higher end of the Narcissistic Personality Disorder can do is engage in mindfulness meditation. The next best thing (I kid you not) is to possibly take paracetamol. However, Lewis does remember his scientific training and does temper his speculations with scientific caution. Lewis does spend considerable effort (including drawings) on trying to explain the neurological basis of each sin. I did not until I read this book realise the importance of the dACC which is short for Dorsal anterior cingulate cortex. The dACC is constantly implicated under circumstances where a person feels social pain. A major theme of the book is how each person must balance the needs of self against the needs of society. Up till recent times religion has played an important role in formulating the answers and providing a social community. In the modern Western world religion has lost that role and Lewis in this book is trying to provide a replacement. It is a big ask but to his credit Lewis has taken the first steps. The book has a website http://sciofsin.com/ that provides an insight in the book and the author.